For nearly five decades, Bukiet Building and Management Co. Has been building fine homes for New Jersey families. Having built successful communities statewide, the firm has set industry records for quality, integrity and innovation. The family owned organization, which now includes second-generations partners, has been responsible for virtually every type of residential product including single-family dwellings, luxury town homes, patio home condominiums, and rental communities. They have also developed office buildings and retail centers. In each undertaking, the firm has focused on creative architecture, quality construction and materials and environmental responsibility. Whether developing a sophisticated luxury home or an entry level townhouse, Bukiet Building &Management has been committed to providing maximum value for their buyers. This fact can be attested to by the thousands of families who now call a Bukiet-built residence their home. The firm, founded by Joseph Bukiet, has inaugurated building procedures that have become industry standards. They were New Jersey’s first builder to install underground electric lines and among the first to construct it’s own sewers and water facilities within their new developments. 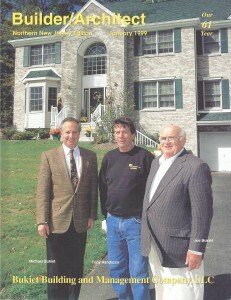 Included amongst the firm’s recent accomplishments are single family dwellings at Diamond Hills at Marlboro, an acclaimed enclave of luxury homes in a million dollar Monmouth County neighborhood; Summit at Durand Park and Huntington Knolls in Freehold Township; Poet’s Peak in Roxbury and Antler Ridge, luxury estate homes in Sparta. The firm has also been responsible for Poet’s Corner, an innovative patio-home community and Poet’s Square, a colonial-styled retail center in Freehold Township. While the measure of commercial success can be seen in the obvious strong public acceptance of their homes, Bukiet Building & Management Co. has earned recognition by it’s own industry. The firm has been named by Professional Builder magazine as one of the nation’s top residential builders. Over the years the Bukiet firm has received prestigious awards citing their innovation and planning excellence. And although these honors are a source of pride, the firm’s greatest honor comes from the thousands of families who call a Bukiet house “home”.